The title of this post has dramatically over-promised on the actual content. Sorry. I’ve talked a little before about race penalties. Since race penalties are specifically intended to adjust for the strength of the field, I thought it would interesting to think up some way to see how well they do that. Everything having to do with FIS points revolves around measuring people relative to the fastest skiers in the world (i.e. by definition, people who win World Cup races). Someone racing in, say, a domestic collegiate race might wonder whether the FIS points they get that day actually reflect the FIS points they’d get if they had done a World Cup race instead. Since FIS points for sprinting are, well, kind of dumb, we’ll just look at distance events. Let’s begin with the so called “minor league” races: OPA and Scandinavian Cups. I looked for skiers who had done at least one “minor league” race and at least one World Cup race within the same season. It turns out that this happens fairly rarely, or at least less than you might think. How often? Well, generally we see around 20-25 women and 30-35 men each season. But oftentimes, these skiers will have done only one World Cup, or conversely only one OPA/SC. For the time being, I’m going to ignore this paucity of data and push forward. An absolutely perfect relationship would lie exactly on the diagonal white line. The blue lines are (non-linear) trend lines. (a) There does appear to be a correlation that (roughly) tracks the hypothesized relationship, so maybe things aren’t all bad. (b) The variability in this relationship can swing as high as 50-100 points! That’s so huge as to make any correlation we see essentially meaningless. 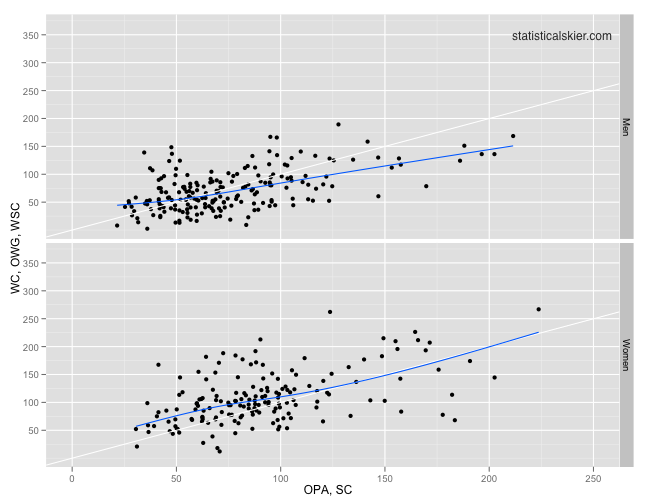 Additionally, the correlation for men appears noticeably less than one, and something hinky is going on with women who score low points in OPA and SC races. Still, I think the general message here is that the FIS points you get (at least in an OPA or SC race) are, on average[1. The key, here, being “on average”. What we’ll see for specific athletes in specific races can vary dramatically, as the graph clearly shows. ], at least a reasonable indication of what you’d get in a World Cup race. Posted by Joran on Wednesday, August 24, 2011, at 6:00 am. Filed under Analysis, Cross Country. Tagged Analysis, opa cup, scandinavian cup, World Cup. Follow any responses to this post with its comments RSS feed. You can post a comment or trackback from your blog.